The Free Trade Agreement between Switzerland and China was signed last Saturday at the Ministry of Commerce in Beijing. 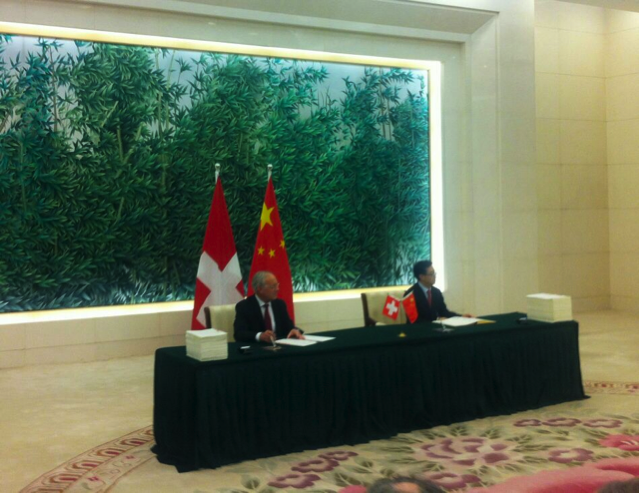 Undoubtedly, it marks a new era in Sino-Swiss relations. This major milestone was preceded by many others. One of the first ones dates back to 2007, when the Swiss government recognized China’s full market economy status. This was followed by a discussion on a feasibility study on an FTA in 2009. 2010 saw the conclusion of this study with both parties endorsing its conclusions and recommendations by signing a Memorandum of Understanding on August 13th, 2010. Actual negotiations began in 2011 and comprised nine rounds. And on July 6th, 2013, Federal Councilor Johann Schneider-Ammann and Minister of Commerce Gao Hucheng both inked the final version of the FTA. What will now follow are the ratification processes of China and Switzerland. On the Swiss side its duration may take anywhere from one-and-a-half years to several. On the Chinese side it is expected to take less long.